You may not even seen on your store shelves yet, but you will. Big thanks to Stone Ridge for letting me try before I buy, but there is a problem: I am totally the WRONG person to be reviewing these products. I just don't like tart yogurt. It seems like it's a good product, and I dig two of the flavor choices ( strawberry and pomegranate blueberry ), but I just can't get over the tartness. This blog has let you know that I definitely lean towards the sweet side of life, not too sweet ofcourse, but sweet is the way to go for me. This doesn't mean I can't hand over some details and get you excited about this upcoming product (well, if you're a yogurt lover anyway). 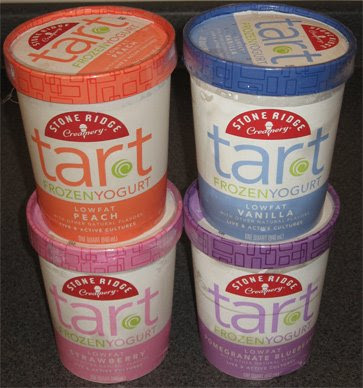 Stone Ridge is starting off with four flavors: Vanilla, Peach, Strawberry and Pomegranate Blueberry. The containers you see before you are quart size, though I'm not sure what the MSRP will be. A 1/2 cup serving weighs 85g and gives you 110 calories, 10 from fat (that's 1g total fat, 0.5g of saturated fat). There's no fiber, and 2 grams of protein ...oh, and 8% of your calcium for the day. Like most yogurts, it contains live active yogurt cultures including l. acidophilus and bifidobacterium. The label says that yogurt should taste like yogurt, and it does ...it just tastes like the kind of yogurt I don't like. While I tried a bite of the vanilla (eh), and two bites of strawberry (better), my first official bowl was made up of pomegranate blueberry. I picked this flavor because when I saw my 4 choices, I started thinking about Hola Fruta Pom Blueberry and thought this might be an interesting variation on that flavor combo. Well, from bite one, I was having trouble with the tartness. I kept going thinking I could get use to it, but it just wasn't working for me. Now the label suggests sprinkling something on top, and I do love grape nuts in my yoplait, so I gave it a try. Yeah...didn't help me, just made things too crunchy. It seems like a quality product, and I want to enjoy it, I just can't. You'll have to pick some up and make your own decision if you like it or not. Manufacturing note: Yes, Stone Ridge products are made in the same factory as Kemps products, but this does not mean they are Kemps products. Stone Ridge has their own recipes, they just don't have their own facilites. This is not uncommon in the industry. 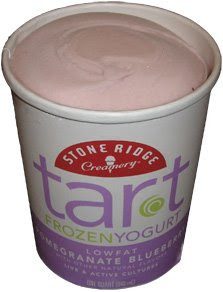 2011 Update: Stone Ridge Creamery has discontinued their line of tart frozen yogurt. Guess I'm not the only one who doesn't like tart. I bought some of the Pom-Blueberry flavor yesterday, I LOVE IT!! I was looking for an alternative to the high fat premium ice creams and saw this brand. The frozen yogurt is creamy and doesnt have that "fake" ice cream taste. If you are a fan of regular yogurt and not the more sweeter brands you will enjoy the tart flavor. At a price point of $2.50 I am adding this frozen yogurt to my reduced fat eating plan! I love it. I am trying to reduce my sugar intake and I am also lactose intolerant so I have tried many brands of frozen yogurt. This and Kemps fat free frozen yogurt are my favorites. I enjoy the tartness and I sprinkle crumbled graham crackers on it. I have two more flavors to try, the strawberry was good and I love the peach. I also like the creamy texture. I hope they bring out some new flavors soon. We have tried all but the Strawberry, and love peach and pomegranate-blueberry the most. The tartness against a piece of pie is a beautiful thing. I won't go back to regular Ice Cream or sweet Frozen Yogurt again. We even tried a Haagen dazs Tart yogurt that was waxy by comparison. This is the best. A little goes a long way. It was terrible! No one in my family could get past the vinegar-like taste! However, if your taste buds were somehow damaged, or you just really like tart stuff... then you have found yourself a product!!!! Where can I buy this awesome product? i live in Atlanta, GA.
go to http://www.supervalu.com/sv-webapp/ and scroll to the bottom of the page, there you will see a list of supervalu owner grocery store chains. which ever one is local to you, that's where you will find it. This is some of the best frozen yogurt I've ever eaten.. I love the tartness! I found it in Idaho and now I'm in North Carolina ... where can I find it here? Please help! i bought the vanilla, and the first time i tried it i hated it, but as 2 days later into my diet, i had a craving for something sweet, and i took a bite now i'm loving it! if you reduce your sugar intake you will like this product and it will help you with your cravings for real icecreamm!! HELP! Jewel food stores stopped carrying Tart, and I don't know what I will do! Is anyone else in Chicago going to start carrying it? I love the Strawberry and Pom-Blueberry flavors! It's great with fruit toppings (fresh berries) and mochi! I am in the suburbs of Chicago and used to buy this product at Jewel, but they are no longer carrying it! If anyone in the area finds a seller, please post!!! Pom-Blueberry is badass, Acme stopped carrying it thus proving they are NOT. Tart Pomegranate Blueberry frozen yogurt is akin taste-wise to the Pinkberry chain's pomegranate yogurt. I absolutely LOVE Tart frozen yogurt & this is coming from someone who doesn't like yogurt! I found it at Albertson's grocery store in Culver City, CA, but it appears as though they've stopped carrying it. I've Googled Stone Ridge Creamery and all I get are results pertaining to reviews. I absolutely want more Tart frozen yogurt in my freezer NOW!!! I actually contacted SuperValu who is the parent company to Stone Ridge Creamery. They informed me that they discontinued this delicious product but would send along my feedback to product development about my disappointment that I haven't been able to find it. You should do the same if you want it back in stores! I just left the product info blank since I didn't know the UPC numbers. Confirmed! SRC Tart Froyo is no more! I would suggest trying Kemps Fro-zing, or if you are desperate, Walmart distributes tart froyo single serve treats. I LOVE this Tart Frozen Yogurt, I should have know that it would be discontinued. It is the BEST yogurt I have ever eaten, its tartness gives it that special mummm. I would buy two or three of each, each time. I BEG YOU please don't phase out this wonderful treat. Why should we who love it have to give it up because some people haven't tried it. It is a healthier treat than ice cream and IT's WONDERFUL. PLEASE DON'T TAKE IT AWAY FROM US. @lisa: thanks for the warning! I can now GUARANTEE I will never try it!